No One’s Coming is a choreography for 12 plastic people and one alien, an homage to movies such as “Dinner for One”, “Whatever Happened to Baby Jane” and “Streetcar Named Desire.” It’s about a dance company which never arrived and it also deals with the subject of incredible versatility of a contemporary dancer. 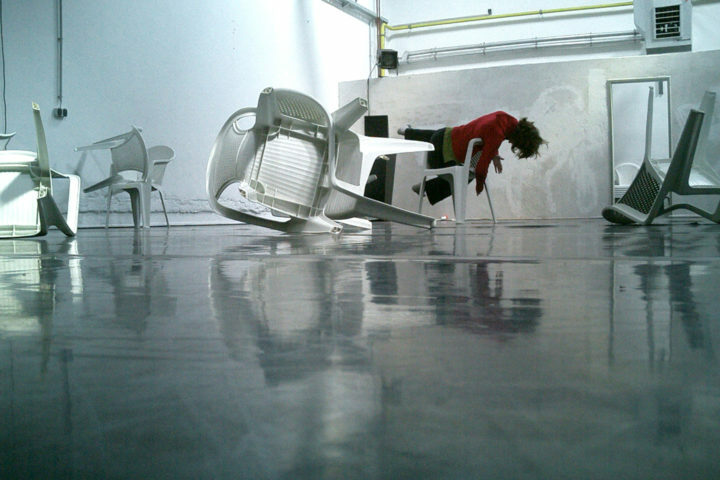 No One’s Coming is a living installation made out of everyday objects found lying around in a rehearsal space. Some main features of the installation are that it makes light of loneliness and the relief of finally being on one’s own. In our research at the CCL we focused mainly on the performer’s “soundbody” and how it translates into a stage language. Every person has a kind of soundbody which surrounds them like an aura and makes their movement language audible. The goal is to expand the visual space through the use of the acoustic environment and to produce a virtual stage setting through the electro-acoustic amplification of the performer’s soundbody.